I have a friend whose favorite food product is the yam, and her favorite food preparation style is curry. So naturally, when she came to visit a couple of days ago, a yam curry was in order. Mind you, those big tubers that we get in the grocery store are not properly yams. Yam is the common name for some species in the genus Dioscorea. These are perennial herbaceous vines cultivated for the consumption of their starchy tubers in Africa, Asia, Latin America and Oceania. Those golden orange goodies called “yam” in most U.S. groceries are the sweet potato (Ipomoea batatas), typically one of the darker, orangey strains. Botany aside, we’ll use the term yam here, because that is what most people know them as – and it is not likely you will go on a field trip looking for the true yam. The original recipe for this came from Cooking Light. I made it according to the recipe, as pictured. However, the original recipe called for 3 potatoes, with out accounting for the size of the tubers. Mine were really big, and they kind of overwhelmed the dish, even for someone who loves yams. So I made a more precise measurement, and also recommend cutting them into smaller pieces so you can get a mouthful of pork and yam at the same time. I served it over brown rice. This is not heavily curry-spiced, like Indian curries. 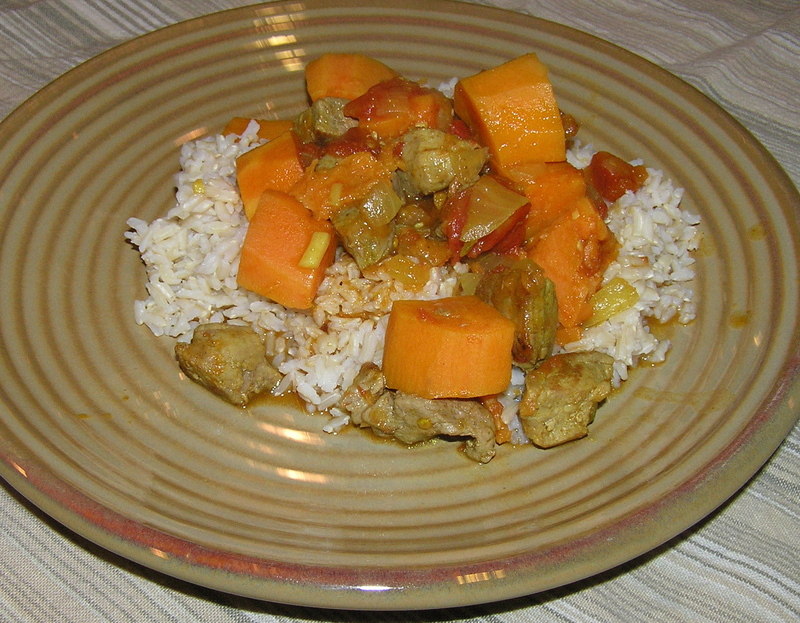 It is somewhat more tomato-based, and to my mind, has a bit of a fresher flavor (although I love South Asian curries). In a medium bowl, toss pork with 1 teaspoon curry powder and salt. Heat 1 teaspoon oil in a large skillet that can be covered (I use my stir fry pan) over high heat. Add pork and cook, stirring often until brown on all side. It takes about 5 minutes. Remove from pan and transfer to a plate. Using the same pan, reduce heat to medium-low and add remaining t teaspoon oil to the pan. Add onion, garlic, and chili pepper; cook, stirring occasionally, until softened, about 3 minutes. Stir in remaining 2 teaspoons curry powder and cook for one minute more. Add chicken broth, yams, and tomatoes and bring to a simmer. Cover and cook until sweet potatoes are tender and sauce has thickened somewhat. This takes 20-30 minutes. Add the pork you set aside, and cook until heated thoroughly, about 3 minutes. Add black pepper to taste. Makes 4 servings at about 5 grams of fat/serving. *Ingredient note: During the recent scare about e-coli and jalapeno peppers, I bought a jar of dried jalapenos. I used 1/2 teaspoon of this in the curry – which made it warm, but not hot. You could use more. I actually like having the dried peppers, since I have a habit of buying them fresh and having them go bad before I get a chance to use them. I’m not sure how they would work in a salad, but in a curry they’re fine. 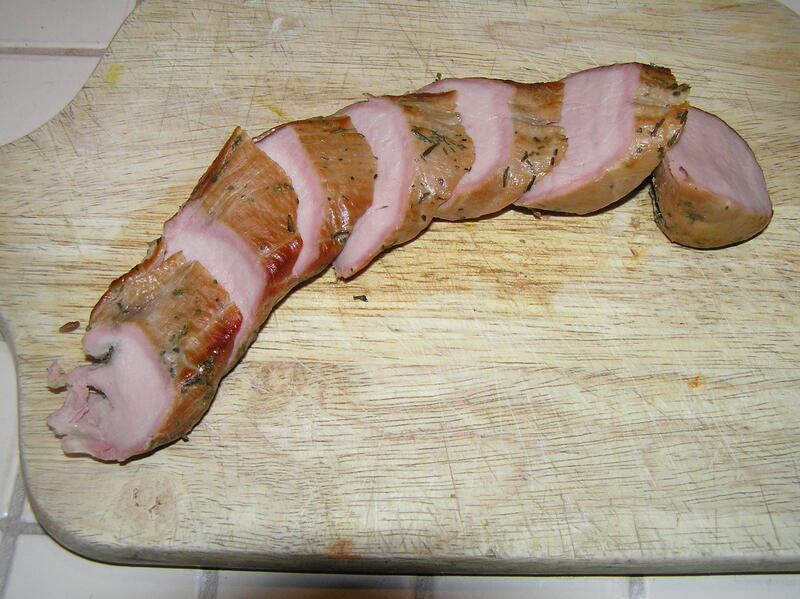 When I smoked the pork tenderloins a few days ago, I left one tenderloin out to use in a Bavarian-style main dish. Bavarian food is more filling and hearty than delicate. 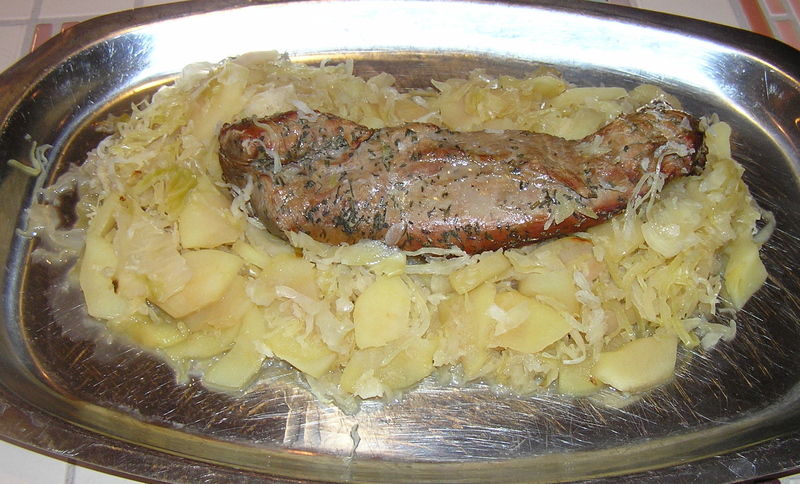 Pork is probably the single most important food in Bavaria, with potatoes running a close second. This is food for an early fall day when the air is crisp in the morning, and by dinner you want something a bit substantial. I originally planned to cook the smoked tenderloin in beer and sauerkraut, hearkening back to the days when I was young, poor, and had never hear of fat grams – and cooked large, cheap fatty pork steaks in sauerkraut and beer for dinner, served with mashed potatoes. 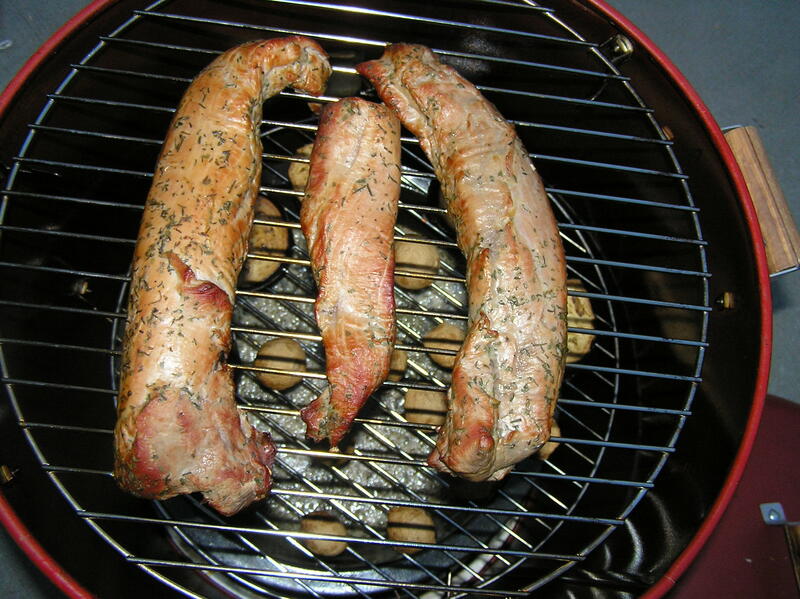 But I had already marinated the pork tenderloin in beer and herbs before smoking it, and I didn’t want beer flavor overwhelming the dish, since the pork had a nice flavor of its own. This experiment came out even better than I expected it to. I served it with plan boiled potatoes. Preheat oven to 350 F. In a medium bowl, mix sauerkraut, apples, and brown sugar together. Place 1/2 of sauerkraut mixture in a casserole that is long enough to hold the pork tenderloin. Place pork tenderloin on top of the sauerkraut mixture and cover with the remaining sauerkraut. Cover casserole and bake for 1 hour. Remove from oven, Slice pork tenderloin cross wise and serve over sauerkraut mixture. This makes 4 four ounce servings at about 4 grams of fat/serving. The sauerkraut I used was an old-fashioned sauerkraut that was less tangy than most deli sauerkraut – almost a little sweet. I think that regular sauerkraut would work as well. I took the smoker out again to make pork tenderloin, a very versatile meat. I didn’t do anything elaborate with it, because I am going to use one tenderloin to make sandwiches for lunch, and the other as the main ingredient for a Bavarian main dish I’m planning later in the week. Smoked Pork tenderloin is leaner than most lunch meat (about 0.7 grams of fat/ounce), and it doesn’t have all the salt and preservatives of packaged lunch meats. And smoking is so easy to do – it sits in the smoker and cooks itself. Trim all fat from pork tenderloins. Put beer, savory, and chervil in a gallon zip top plastic bag. Add pork tenderloins and seal bag, making sure that tenderloins are covered in marinade. Refrigerate for about 2 hours, turning occasionally. Following the directions on your smoker, smoke for 2 1/2 hours. I poured the marinade into the drip pan and added water to it, then smoked the pork over alder wood. 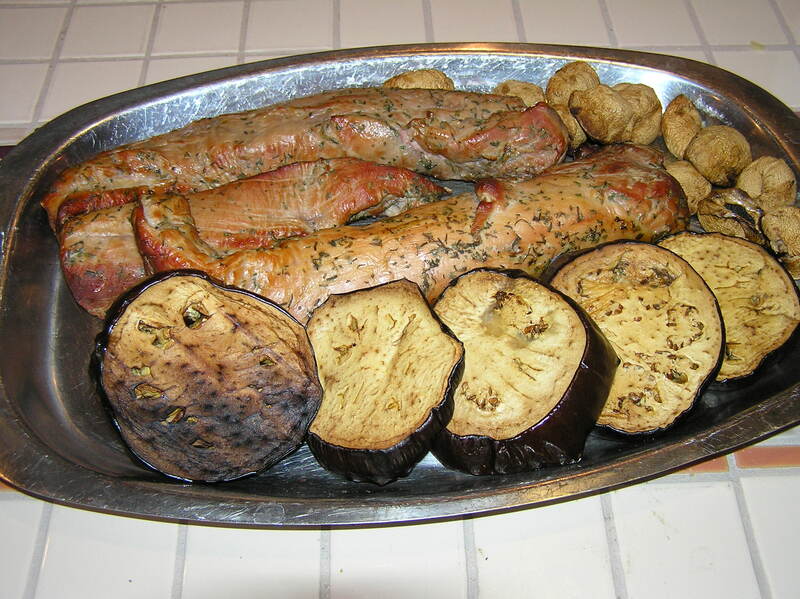 I also smoked mushrooms and eggplant with the pork to use in other dishes. No sense running the smoker half empty. The fat gram/serving depends on how much you eat. I had 5 ounces for dinner, for about 3.5 grams of fat.